Uranium for Nuclear, Phosphate for Agriculture, and Electric Metals. Yttrium (a rare earth element) used principally in laser technology and as a red phosphor in screens for electronics. The Preliminary Economic Assessment on Berlin estimates that the deposit would generate revenue of US$2.8 billion over the 15-year mine life. Estimated revenue from by-products alone would be US$1.8 billion, which would cover the estimated operating cost of US$1.6 billion. In other words, estimated by-product revenue completely pay for the mining and extraction uranium – and so uranium can be considered to be extracted at no cost. Uranium for nuclear fuel: Nuclear is a clean source of energy – considered to be “low-carbon” because, although reactors don’t emit carbon or greenhouse gases, conventional fuel is used in the mining, processing and transport of uranium and its fabrication into fuel rods. Phosphate for fertilizer: Phosphate is one of the three principal components of agricultural fertilizer. The percentage of phosphate contained in a fertilizer is shown in the middle number in the label; for example, a 20-10-5 fertilizer contains 20% nitrogen, 10% phosphate and 5% potash. Phosphate is a primary nutrient for plants and is especially important for strong root growth. In addition to phosphate, the Berlin deposit could also produce five of the nine micronutrients used in speciality fertilizers: molybdenum, zinc, nickel from the deposit and manganese and iron that would be recovered after iron and manganese reagents are used in processing of the mineralized rock. Battery Commodities: One of the biggest challenges in the renewable energy industry is energy storage – which represents an attractive business opportunity. Lithium ion batteries are good for short-duration, high power output and apart from lithium, they contain graphite, nickel, cobalt, vanadium and phosphate is being used in the newer types. Vanadium redox batteries complement lithium ion batteries in mixed battery systems because their sweet-spot is long duration, lower power output. Of these “battery commodities” Berlin would produce nickel, vanadium and phosphate. Mineral properties that have potential to contain cobalt are being investigated by U3O8 Corp. elsewhere. 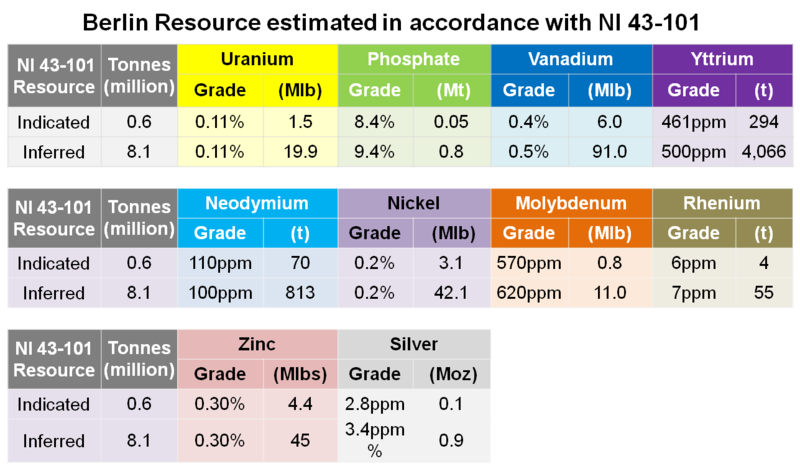 Rare Earth Elements or REEs: The Preliminary Economic Assessment undertaken on the Berlin Deposit only took into account the value of two of the REEs: yttrium and neodymium whereas, in fact, all of the REEs would be precipitated in a mixed REE oxide that would be sent to a specialized refinery for further processing and separation into individual metals of required purity. In contrast to many other deposits where the extraction of REEs is complex and expensive, the REEs at Berlin dissolve into solution along with the other metals and phosphate with no extra effort or cost on our part. There is an opportunity, therefore, to increase the revenue estimate from the Berlin Project by including other REEs in future economic studies, rather than limiting the economic analysis to yttrium and neodymium. REEs are used in innumerable high-tech applications including components in electronics, phosphors in screens and components of superconductors. Of particular importance to the clean energy industry are the super-magnet metals: neodymium, dysprosium and samarium. Magnets made from alloys of these metals are 40 times as strong as ordinary iron magnets, and so they are critical components of high-efficiency electric motors and generators. For context and comparative purposes, the REE content of the Berlin Deposit and the Elliot Lake (3). Deposit in Ontario, which is reportedly being advanced towards REE production, is shown below. 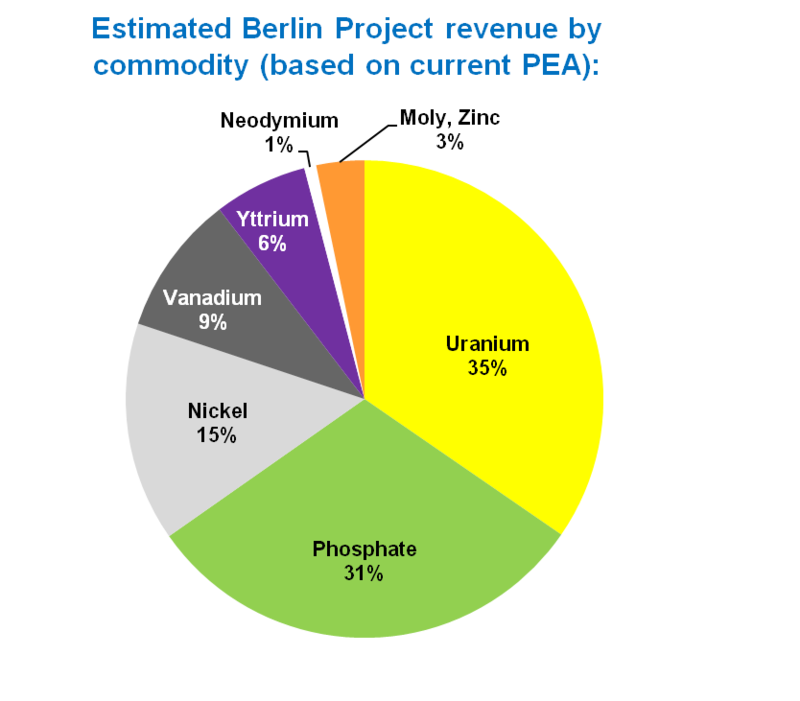 Note that potential revenues from REEs at Berlin would still represent a relatively small constituent of total revenue due to the value of the other potential by-products such as phosphate, nickel, vanadium and other metals. Rhenium: A resource estimate was made for rhenium in the Berlin Deposit, although potential revenue was excluded from the Preliminary Economic Assessment. Rhenium is commonly a by-product of molybdenum production from porphyry deposits. It is used principally in nickel-based superalloys that have very high temperature tolerance and are used extensively in jet engines and rocket motors. One sedimentary layer in the Berlin area contains about 10% phosphate, and it is in this unit that the metals are concentrated. Uranium and phosphate generate about 1/3 of the project’s revenue each, with the other third coming from nickel, vanadium and yttrium, principally. The phosphate layer at Berlin averages 3 metres (10 feet) thick and would be mined by underground methods. Mined rock would be milled and would undergo a single process to leach the phosphate and metals from the host rock. It is unusual for one process to be used for the extraction of such a large suite of commodities, and this natural advantage results in relatively low operating costs. The process that has been extensively tested on rock from Berlin is ferric leach, which was used for decades in the Elliot Lake mining camp in Ontario for the extraction of uranium and yttrium (a rare earth element). Leaching of the mineralized rock at Berlin would result in all of the commodities being in solution, from which they would be extracted in a specific sequence with moly extracted first, followed by uranium and vanadium, phosphoric acid, rare earth elements and finally a mixed nickel, zinc and manganese oxide. The Preliminary Economic Assessment established an average annual production of 1.2 million pounds of uranium (U3O8) from mill throughput of 500,000 tonnes per year for 15 years. The capital cost estimate is US$441 million, including a US$41 million contingency and sustaining capital of US$40 million. The high capex of the Berlin Project is a major barrier to advancing the deposit toward production – and there are a number of ways in which capex may be reduced. One of the principal opportunities is through test work on the suitability of membrane technology to isolate the various elements from one another so that they can be more efficiently extracted. Membrane technology, which is used in some metal processing plants metal refineries and for the purification of phosphoric acid for decades, uses a series of chemical membranes to concentrate each desired metal. The process works by metal-laden fluids flowing through sets of paired membranes; the upstream membrane having microscopic apertures that are always slightly larger than those in the downstream membrane. Using uranium as an example, uranium ions would be concentrated between a membrane that has apertures just larger than a uranium ion on the upstream side and one with apertures just smaller than the uranium ion on the downstream side as the metal-laden fluid passes through the system. The pair of membranes specifically designed to concentrate uranium would be part of a multiple membrane system in which each pair is engineered to concentrate ions of a specific type such as vanadium, phosphate, etc. This is essentially the same process that is used in water purification except that here, the emphasis is on extracting metals as well as the generation of pure water, rather than on the generation of clean water only. The metals are extracted from the concentrated solution between each membrane pair by an appropriate means such as ion exchange, solvent extraction or direct precipitation. If test work demonstrated that membrane technology was effective for the Berlin Project, it has the potential to reduce capex of the processing plant and also to reduce operating costs which would further improve the economics of the project. The 21 million pound uranium resource at Berlin, or roughly 60 million pounds of uranium equivalent if one takes into account the value of the potential by-products, is from the southern 3 kilometres of a mineralized zone that is 10.5 kilometres long. U3O8 Corp.’s exploration of the northern part of the property by trenching and drilling cut similar grades in the same metal suite in the same phosphate layer. These exploration results have led U3O8 Corp. to conclude that there is potential for the uranium resource in Berlin Project to grow to between 70 and 75 million pounds (4). 1. See the January 18, 2013 technical report: “Berlin Project, Colombia – Preliminary Economic Assessment, NI 43-101 Report.” The PEA is preliminary in nature and includes inferred mineral resources that are not mineral reserves and do not have demonstrated economic viability. There is no certainty that the PEA will be realized. 4. Berlin Project – Based on exploration of other mineralized areas, there is an additional exploration target of 20-27Mt at 0.09% to 0.11% U3O8 (50-55Mlb) on the remaining 7.5km of the trend – see September 20, 2012 press release. Potential quantity and grades are conceptual in nature. There has been insufficient exploration to define a mineral resource north of the current Berlin Deposit. It is uncertain if further exploration will result in additional mineral resources being delineated on the property.